Better Office Coffee- is your coffee machine a perk for employees? If you work in HR then you may well want to listen up here. Printerland, the UK’s largest printer and consumables reseller, recently surveyed 2000 British workers on their coffee habits and the feedback makes quite interesting reading. The research revealed that 46% of millennials would turn down higher wages and longer holidays for better quality coffee at work. Over a fifth of 18-24 year old employees would turn down a pay rise of as much as five per cent for better brews. And almost a third (32%) said that they would forego additional annual leave, with 12% turning down a full week’s extra holiday for a decent tea break. However, only 15% of 35-44 year olds, the Gen Xers, would be willing to do the same, and just 9% would pass on a pay increase. 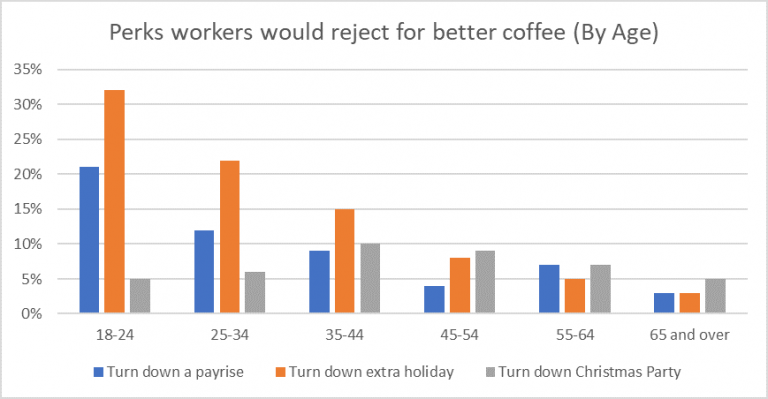 The Gen Xers were the most keen to give up social events with 10% willing to cancel the Christmas do for a better barista brew. Catherine Bannan, HR Manager at Printerland.co.uk, said: “Millennials are often labelled as unsatisfied with regards to their jobs. However, we believe that it’s simply a case of different priorities. However, the most startling fact to emerge from the survey is that some employers seem to have abandoned the tea break altogether. Over a third of offices don’t have any tea making facilities available to staff – meaning these drink-deprived Brits are having to fork out an average of £14.31 a week to get their caffeine fix, totalling over £700 a year. Now that’s just shocking!